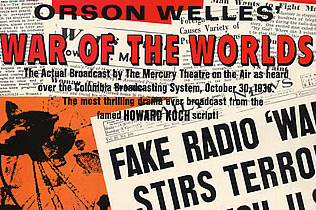 My 7-year-old son and I listened to the famous Orson Welles “War of the Worlds” broadcast from Oct. 30, 1938, a radio treat that tricked many listeners into thinking Martians had actually landed on Earth and were taking over. “It’s the end of the world!” people cried out at the time, calling police, fire and newspapers for information and help. I told my son that this single broadcast caused major panic across the country. The kid realized what he said. He felt bad for suggesting such a thing. Before my son and I could plan our Halloween prank for Mommy, sirens outside drew us to the windows for a peek. We saw several fire trucks and police vehicles whistling by. News vans were close behind. Our neighbors poured out into their driveways to see what was going on. I ran to the TV, flipped on the news. Outside, just over the hill, helicopters circled, lights flashed. Black unmarked vehicles sped down my street toward the action. Martians? How ridiculous. Was I supposed to believe that? I planned for my family’s immediate evacuation -- just in case. My wife walked in to find me packing. As the day progressed, we learned this was no joke. Really. I had all the essentials packed -- underwear, socks, toothbrush, DVD collection. My son packed his coloring books. As I made sure the air conditioning was off, the lights were on timers and the doors were locked, my wife shifted gears into small talk about work. My neighbor was still following us around the house. My wife got upset at me for giving the neighbor attention and not listening to her. “You never listen to me,” she said. Then I noticed that a timer on one of the lights in my house was set for the wrong time. My wife meant business, so much so our neighbor had to evacuate when he heard the tone in her voice. And though we soon after discovered that there were no Martians, that instead all the commotion over the hill was due to a small brush fire that was put out in less than 30 minutes, the moral of the story remains: Even the end of the world isn’t more important than what your wife is telling you. This, unlike Orson Welles’ “War of the Worlds,” is no joke.